In one simple step, you’re able to bulk delete student blogs using My Class. Do NOT delete a blog to create a new username or fix an issue with a student username. Please contact Edublogs support if you need to change a username or remove old posts so we can assist. 2. Select the check boxes next to the blogs you want to delete. 3. 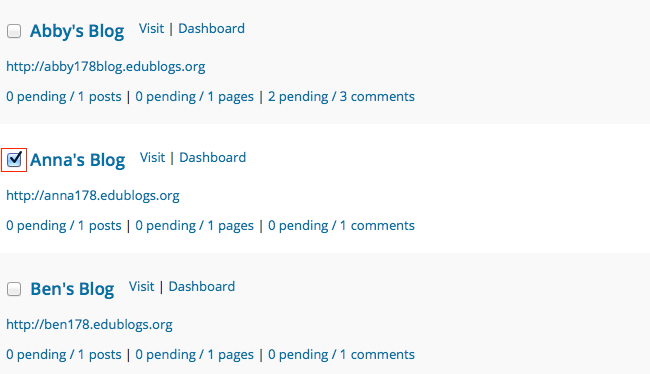 Select ‘Delete selected blogs‘ from the ‘Choose Action’ drop-down menu. 5. This will automatically deletes these blogs and removes them from your Student Blogs page. Once a blog has been deleted no one is able to create a new blog with that same blog URL. Please contact Edublogs Support if you’ve deleted a student blog by mistake and need us to bring the blog back online. Please include an alternative email address — in case your school email account blocks replies from Edublogs support.